From comic conventions to business conferences, badge ribbons are all the rave! 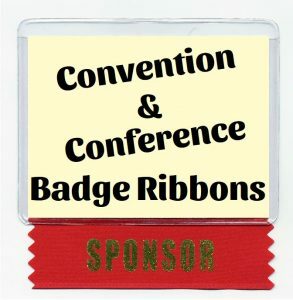 Each badge ribbon obtained from a conference or convention serves a purpose. So, what happens when they are all combined? And where do you put them all? Every badge ribbon is used as an identifier and as a visual stimulant. Badge ribbons can make someone stand out from a crowd. They are also suggested as an effective way to make an initial introduction and break the ice for those attending a social meeting. These ribbons can be found nearly anywhere, but most badge ribbons are obtained from trade shows, conventions, conferences, meetings or other social functions. No matter the convention, there are sure to be badge ribbons available to wear on your name badge. Why not make the most of them? And, the more, the merrier! So, what is a Badge Ribbon? Made from a small piece of ribbon, each convention ribbon typically features titles or basic information about the event. However, the titles can also be silly and inventive. And, while most badge ribbons are text only, full color printing is available for adding pizzazz to any badge ribbon. Seriously, the sky is the limit when it comes to convention badge ribbons. Feature television or movie quotes on ribbons. Or, provide character names from books or theater productions. But remember to keep in mind the topic and theme of the convention or conference. 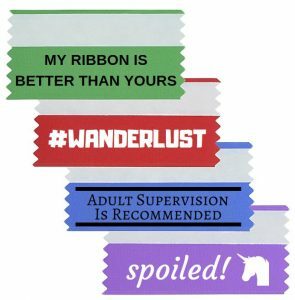 Badge ribbons are a fun way to add your unique flair to your convention or conference experience. Using the adhesive strip on the top of each ribbon, attach each one to a badge holder or name tag. And, the best part of each badge ribbon is showing off how many and which ones you have. These ribbons come in a wide range of styles and colors, and it’s entirely upon the individual to create and distribute their badge ribbons. From funny titles and sayings to identifying attendees and knowing who sponsors and speakers are, badge ribbons will always play an important role at any convention or conference. While conferences and conventions don’t differ significantly, badge ribbons can have a different use at every event. Conventions typically give out ribbons to represent fandoms and current fads. This differs from a conference ribbon which will usually only represent speakers, presenters, ushers, vendors and more. Conference ribbons attach to the bottom of a name badge and help to identify someone’s role at an event. While at a convention, multiple ribbons can express personality rather than only play the role of identification. Badge ribbons are an excellent way to break the ice and stop any awkward stares or uncomfortable moments when someone doesn’t know what to say or how to introduce themselves. 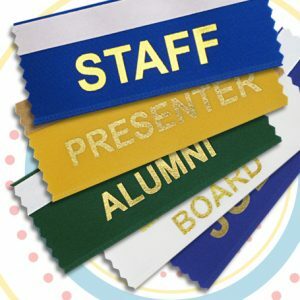 Stacking personalized ribbons on name badges is an effective way to identify any role at these events. So, let your badge ribbon help you to stand out at any event, whether it’s a conference or a convention.